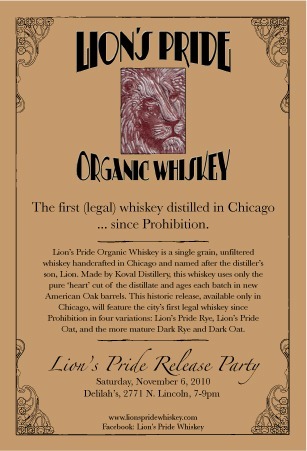 Lion’s Pride Organic Whiskey launches November 6: The first (legal) whiskey distilled in Chicago since Prohibition. Lion’s Pride is made by Koval Distillery, Chicago’s first boutique distillery. Koval makes a number of unique spirits from scratch in their Ravenswood distillery, many which have already won numerous medals in the US and Europe – including two gold medals for the Rye Chicago white whiskey. Lion’s Pride Organic Whiskey is a single grain, unfiltered whiskey handcrafted in Chicago and named after the distiller’s son, Lion. This whiskey uses only the pure ‘heart’ cut of the distillate and ages each batch in new American Oak barrels. This historic release, available only in Chicago this fall, will feature the city’s first legal whiskey since Prohibition in four variations: Lion’s Pride Rye, Lion’s Pride Oat, and the more mature Dark Rye and Dark Oat. Each whiskey is distilled form 100% single grain. The Lion’s Pride Launch Party will be held Saturday, November 6 from 7-9pm at Delilah’s Chicago. Samples of the whiskeys will be complimented by cupcakes made by new Chicago booze bakery, The Baking Lab (using Koval’s liqueurs in their yummy concoctions), and the first two bottles of Lion’s Pride will be auctioned off for local charities. If you live in the Chicago area, better go and check this out then.